Chimpanzees who live at the CCC are orphan victims of illegal wildlife trafficking, and/or babies taken from the pet trade and/or for the bush meat trade. For each chimpanzee that is captured, it is estimated that 10 individuals were killed in the process. As group members protect each other, it is estimated that for the 60 chimpanzees who are residents at the sanctuary, 600 chimpanzees lost their lives. Groups works as a rotation: the Quarantine group, once they have passed health standards, are integrated in to the nursery group. As the chimps grow and mature they move from the nursery group into the small group, or les petites, and finally to the big groups (les moyens and les grand) after several years at the CCC. The Quarantine group is composed of very small babies (ages ~1 to 4 years old). Each morning and afternoon they go out into the bush to climb trees, forage for seasonal fruits, and socialize with each other.. 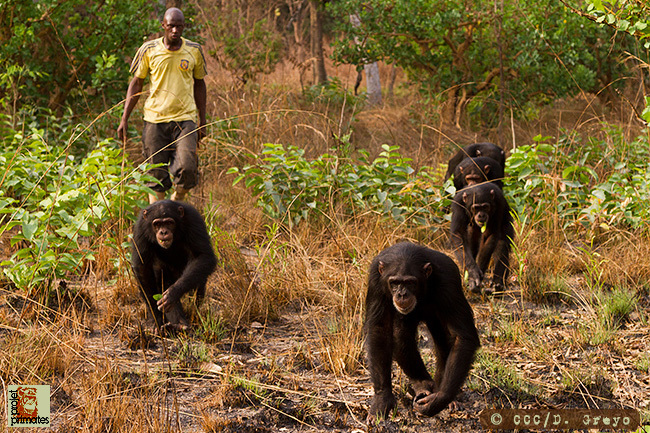 Supervised by a keeper and a volunteer, the chimpanzees have support while exploring and learning about life in the bush. 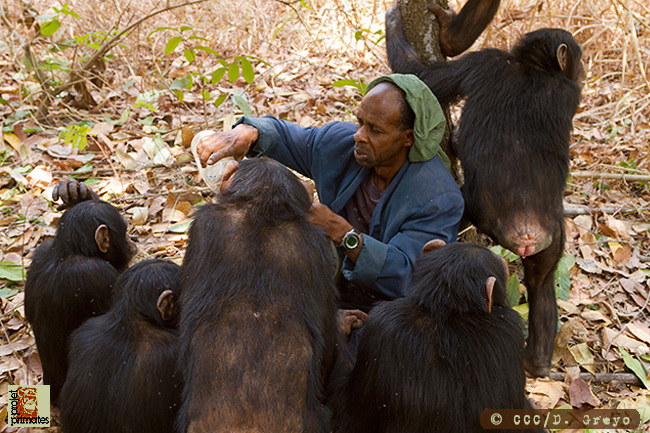 During bush outings, the role of the keepers and volunteers is to provide oversight, guidance, reassurance and encouragement to turn to the chimpanzees. While in the bush, they discover the basics of chimpanzee community dynamics, as they have not been able to acquire these survival skills from their families since they were taken away at such a young age. Learning to interact within a chimpanzee community, they learn to climb trees, discover wild fruits and at the end of a day of exploration, return to their sleeping quarters to rest. This group consists of long-term members of the nursery group, who as they grow older, form a tight bond with their group. Less than 6 years old, the nursery group goes out into the bush every morning and afternoon with a volunteer and a keeper. During their bush outings, they refine their environmental skills. When not in the bush, the nursery group shares a common enclosure where they all sleep together. 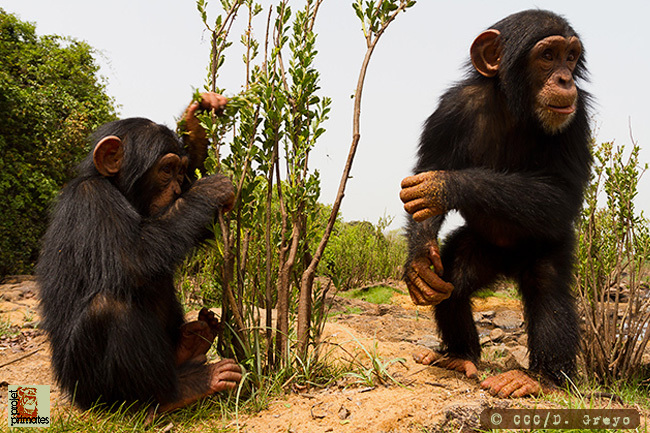 When ready to socialize with other chimpanzees, the nursery group will integrate into the small group. 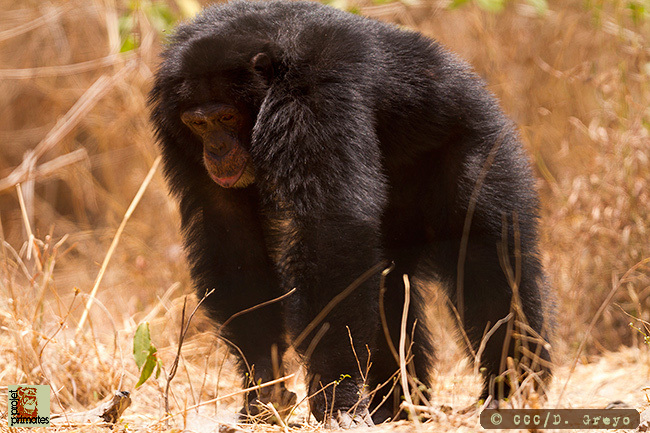 Chimpanzees in the small group feel comfortable during bush outings and are thus empowered and encouraged to seek food, use tools to fish for termites, crack nuts and improve techniques for hunting small mammals such as squirrels, bushbabies and other small mammals. This group, comprised currently of eight individuals, have daily access to a protected outdoor enclosure complete with a jungle gym. During outings in their enclosure, the chimpanzees are further able to improve their social learning and group interactions that allows them to detach from human interactions. The petites actually don’t go out on bush, the have their own enclosure that they have daily access too. But I am not sure if you are taking specifically about the petites? Composed of chimpanzees that are sub-adults and adults, the Big group is actively being prepared for release. Having completed their learning process and transitioned through all of the previous groups, the Big group has access to a 5 hectare enclosure where they can find food, nest in trees at night and advance social behaviors acquired during many years of learning. Les Moyen have daily access to an outdoor enclosure and return to their sleeping quarters at night. Social ties are stronger in these groups and detachment from human interaction is essential. Keepers interact with the Big group only for veterinary care or with occasional help with meals. As this is the final stage before release, this phase lasts for a few years to allow the building of stable, unified community relationships that best reflect that of wild groups. Coco, Zoe and Moucky are three adult chimpanzees who will, unfortunately, not be released. Due to physical and psychological impacts undergone before arriving to the CCC, they have not integrated in to a group. To provide them with the best possible living conditions, the CCC built them three separate cages and large, treed enclosures. Volunteers provide them with daily social contact that is necessary for their well-being. As funds are secured, the CCC plans to further expand their enclosures.